Awarded to Olympic victors (!) the Olive branch has been a symbol of peace and victory for thousands of years since it's origins in early Greek culture. 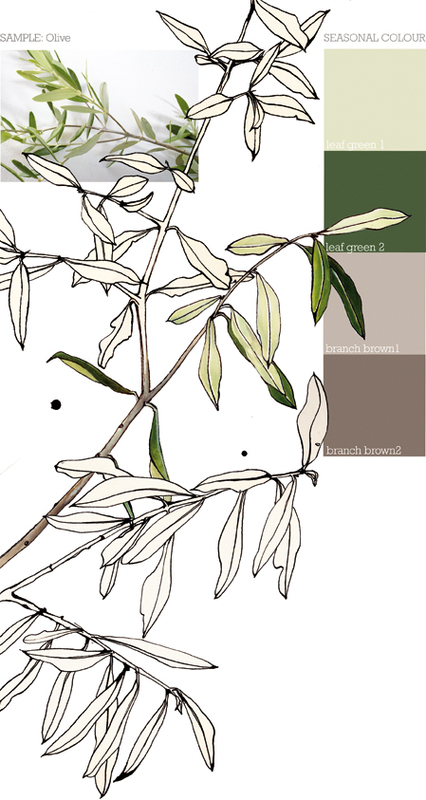 Using a dip pen and ink and line drawing is a great way to fully appreciate the simple form of the Olive branch. Drawing in this way without sketching first in pencil you have to look really hard and draw what's there, not what you think should or might be there. Sometimes I find I'm holding my breath with concentration. The dip pen brings its own free expression to the drawing. I'd imagined the leaves would have more blue in the green, but these colours match the underside of the leaf and the stronger upper green of the older leaves exactly, shown next to the grey browns in the bark - peaceful colours..!